A fun "beach" read set at the South Pole. 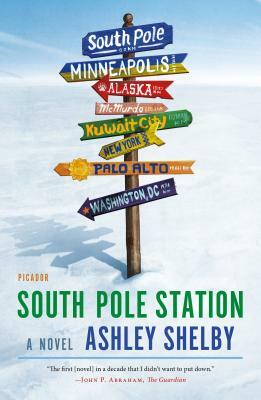 A warmhearted comedy of errors set in the world’s harshest place, Ashley Shelby's South Pole Station is a wry and witty debut novel about the courage it takes to band together when everything around you falls apart. Do you have digestion problems due to stress? Do you have problems with authority? How many alcoholic drinks to you consume a week? Would you rather be a florist or a truck driver? These are some of the questions that determine if you have what it takes to survive at South Pole Station, a place with an average temperature of -54°F and no sunlight for six months a year. Cooper Gosling has just answered five hundred of them. Her results indicate she is abnormal enough for Polar life. Cooper’s not sure if this is an achievement, but she knows she has nothing to lose. Unmoored by a recent family tragedy, she’s adrift at thirty and—despite her early promise as a painter—on the verge of sinking her career. So she accepts her place in the National Science Foundation’s Artists & Writers Program and flees to Antarctica, where she encounters a group of misfits motivated by desires as ambiguous as her own. The only thing the Polies have in common is the conviction that they don’t belong anywhere else. Then a fringe scientist arrives, claiming climate change is a hoax. His presence will rattle this already-imbalanced community, bringing Cooper and the Polies to the center of a global controversy and threatening the ancient ice chip they call home. ASHLEY SHELBY is a former editor at Penguin and a prize-winning writer and journalist. She received her MFA from Columbia University and is the author of Red River Rising: The Anatomy of a Flood and the Survival of an American City, a narrative nonfiction account of the record-breaking flood that, in 1997, devastated Grand Forks, North Dakota. The short story that became the basis for South Pole Station is a winner of the Third Coast Fiction Prize. She lives in the Twin Cities with her family.